Megan Herrick helps a student create a piece of art during class. She gave him new ideas and helpful guidance for finishing his artwork. Students closely watched as she picked up a paintbrush and began to dip it in a cup of water. Then she took a palette of watercolors and activated one color with the water. Next, she took the paintbrush and gently stroked it across the piece of paper, spreading the paint evenly and smoothly with every touch. After her example of illustration was orchestrated, students began to pick up their own paint brushes. They dipped them in a pot of water and activated their individual watercolor palettes. Students then used her watercolor technique to guide them through the art process as they all started stroking their paper, creating various original paintings. Anyone who has taken Art 1, Art 2 or Art 3 has probably encountered the privilege of being taught by Megan Herrick. 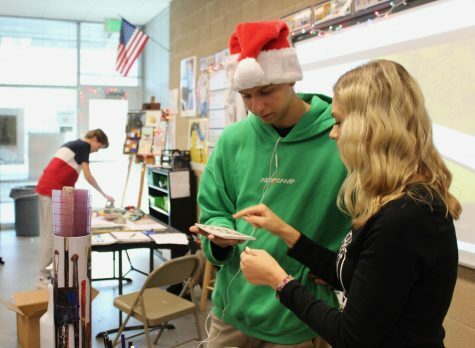 This is her sixth year teaching at Sage Creek, and she previously taught Art 1, Art 2, Ceramics and Digital Photography at Carlsbad High School. Currently, she is not only an art teacher at Sage, but she is also the VAPA Department Chair and a committee member for the City of Carlsbad Cultural Arts Office. With all she is involved in, not only students but teachers and staff noticed as well. She was voted Sage Creek’s Teacher Of the Year. A student creates an original stamp in Herrick’s classroom. All types of artistic techniques were taught to students to cater to their individual interests and talents. Although Herrick has always been artistic, it took various obstacles to finally land on her dream career. Herrick had to listen to her own aspirations and make a decision that would alter her life. “In my heart, I always knew what I wanted to do. Somehow art always came back to me,” Herrick said with a smile. Her approach when teaching her passion involves opening her students up to a variety of “real-world” teachers. She strongly emphasizes how it is crucial to cater to students’ talents individually. Herrick helps senior Nicholas Rhead make a stamp for their ink block project. She was there to give creative ideas and helped to steer his project in a successful direction. Visual Arts Teacher Cathryn Burroughs is Herrick’s old-time close colleague and friend. Before teaching at Sage Creek together, they both worked in the arts at CHS for eight years. Burroughs feels they have a really good partnership together. Herrick not only collaborates with Burroughs, but she also pushes her to be a better art teacher and helps to nudge her in the right direction. Her creative qualities of innovativeness, novelty and leadership provide essential guidance to those around her. Burroughs feels Herrick has an unfaltering determination, dedication and impact in the workplace. Junior Brenna Kelly, who took multiple art classes with Herrick, says that her compassionate personality and creative teaching methods were impactful on her perspective of the arts. Outside of the classroom, Herrick is a mother to four little kids. She is constantly balancing all of her current activities and her personal life and maintains her outstanding gracious attitude as she does it. Burroughs, in awe of Herrick’s accomplishments, questions how it’s at all possible.